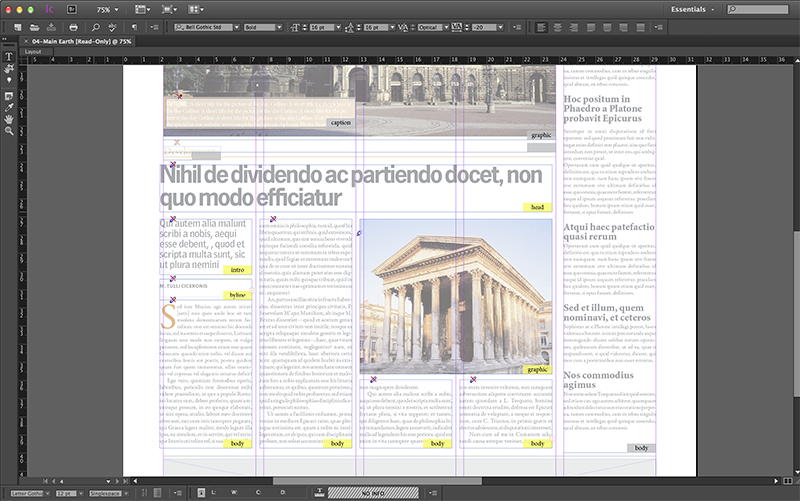 InDesign layouts can be opened directly in InCopy. This makes it possible to see placed articles within the designed layout, check-out a placed article and work on an article from within the page. Layouts are opened in the Layout tab of InCopy. 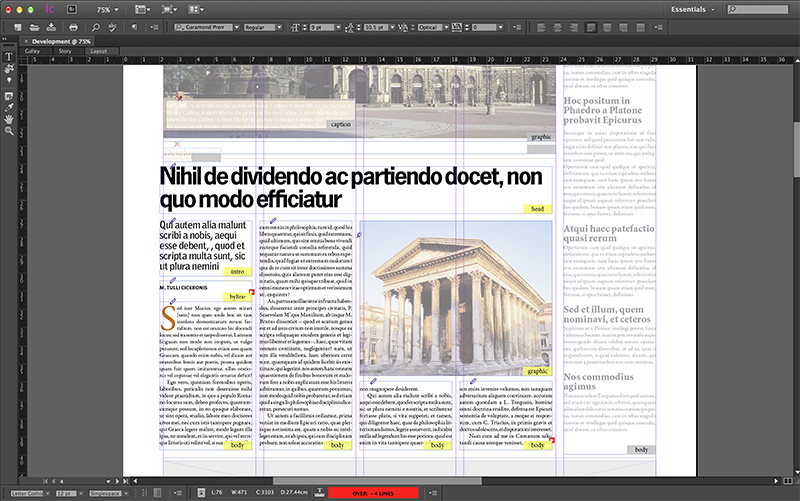 Layouts are opened as read-only documents so that an InDesign user can still open it for editing. When an article is opened that is placed on a layout and the preference 'Bring InCopy Stories to Front' is enabled, all article components of that story are brought to the front in Layout view. For more information, see Opening articles in InCopy using Smart Connection. Opening a layout directly can be done by double-clicking the layout in the Smart Connection panel or the Dossier panel. Because no articles are checked-out during this process, all placed articles appear dimmed in the Layout tab and the Galley and Story tabs are not shown. Figure: A layout opened directly in InCopy. No articles have been checked-out yet so all appeared dimmed and the Galley and Story tabs are not shown. Note: If the article is placed on more than one layout you will be asked to choose the layout that you want to open. Figure: A layout opened in InCopy. One article has been checked-out: it appears un-dimmed while articles that are not checked-out appear dimmed. The article components of the newly opened article are added to the window or tab of the already opened article. Separate in the title bar for each article component in Story or Galley view, on the far right-hand side. The Story, Galley, and Layout tab for that article are displayed in a different window or tab than the already opened article. Only the latest saved version of the layout and that of the article is loaded. This is the default behavior and keeps the loading time to a minimum. The latest stored version of all content that is placed on the layout is loaded. To make this work, Smart Connection for Adobe CC 2014 (version 10.0.1 or higher) is required and the system needs to be configured by the system administrator. Article B is opened in InCopy. The changes that were made in article A can now be seen in the layout view. 2 August 2017. Added information about opening a placed article while bringing its components to the front.